Sub:- Nomination of Nodal bank branches under Single Window Scheme (SWS) for reimbursement of Railway Pension. Please refer to Board’s letter no. 2010/AC-11/2i/2 dt. 31.3.2011(RBA No. 15/2011), 16.5.2012(RBA No. 13, 14/2012), 9.1.2013 (RBA No% 2/2013), 15.1.2013 (RBA No. 3/2013), letter no. 2010/AC-II/21/2(PART) dt. 8.10.2013(RBA No.. 23/2013) and 2013/AC-11/21/8 dt. 28.07.2014(RBA No. 12/2 14), 13.2.2015(RBA No. 12/ 2015) & 7.4.2015( RBA No. 24/2015) where in instructions on implementation of SWS system for pension payment to Railway Pensioners through various Banks were issued. These instructions envisage nomination of nodal branches by the Banks covered under this scheme for submission of Pension Debits by the banks to the designated FA&CAOs. 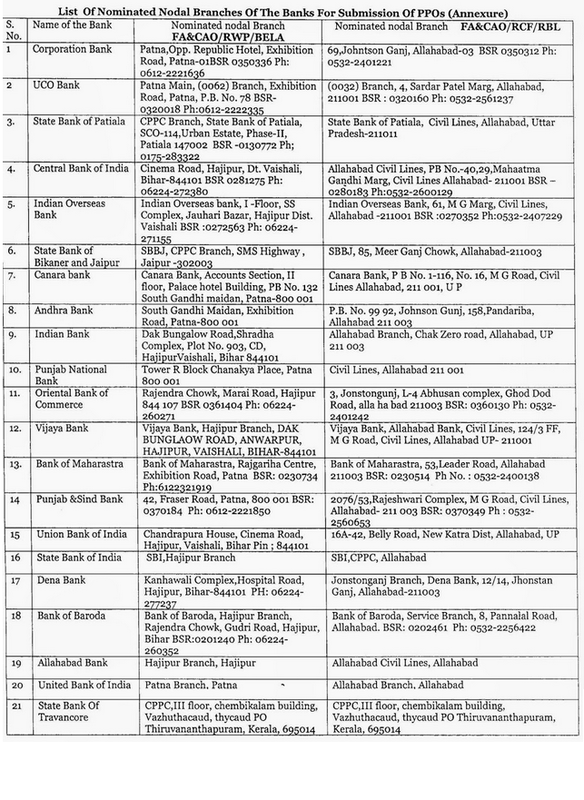 Consequent upon authorization of &CAO/RCF/Rae Bareli and FA&CAO/RWP/Bela for issue of PPOs, the branches as indicated in the Annexure shall be the nodal branches for these units for submission of PPOs.